CHRISTINE POULSON » Should writers marry other writers? Should writers marry other writers? Writing is a solitary activity, involving long periods alone and periods of distraction even when you’re not alone. Thurber’s wife used to say to him ‘Dammit, you’re writing!’ when he sat abstracted at the dinner table. Other writers understand this. When it was one of his days for working at home, Peter and I would retreat to our own separate studies in the morning and later come out to have lunch together. Though even then he would catch me staring into space, not having heard a word he said, as I contemplated ways of murdering people. In the early days we were both academics, but as time went on and I began to write fiction, we became very different kinds of writers. We didn’t always read what the other had written. It didn’t matter. Sometimes I would talk to him when I got stuck and couldn’t work out what should happen next. He would tell me about an interesting piece of research he was doing: for his latest book, Architecture and Ritual, I was fascinated by his work on Chinese magistrates. 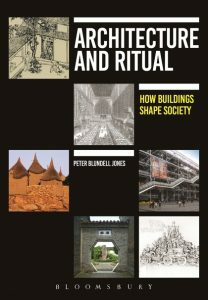 Architecture and Ritual: How Buildings Shape Society was published a few days after Peter’s death, but he saw a copy before we knew how ill he was. I am grateful that he was able to enjoy that. It is the culmination of a lifetime’s work and thought and he was so pleased that Bloomsbury took it on. It’s a worthy end to a distinguished career, though I am sorry too that he didn’t live to write the book on Lethaby that he had begun researching. He would have been the perfect person for that. We enjoyed each other successes and spurred each other on. I don’t think I could have become a novelist and short story writer if I hadn’t been married to Peter and had his support, especially at the beginning. I will miss him in so many ways, and this not the least. What a great piece, and a lovely tribute to your husband. My husband and I have both worked at home for many years, so I recognize much of what you say. It is a different relationship from those who both leave the house every day, and it has its own challenges and adjustments – but it also has its own big rewards and pluses. Starting up again without him will be hard for you – I will be thinking of you. Thanks, Moira. Yes, it had its difficulties, too, but goodness, how I miss him! I do have a novel in draft, so that will be easier than starting from scratch, which I really wouldn’t be able to do at the moment. This is lovely Chrissie. Short and witty, and full of emotion and love. He was a lucky man to have you. You were a lucky woman to have him. I will hunt out Architecture and Ritual. Yes, the just being there is so important and what I will miss so much, just knowing that he is there in the background. What an achingly lovely tribute to a shared life. Thank you for writing it. Peter would be very touched. Thank you, Deb. The house seems very quiet. What a lovely picture of the two of you. It has that clarity and yet poetry of line you each showed in your own field. It rings so true. Often Peter would put his head around my door late in the day. By that time ones head is often full of half understood ideas. We would often chew them over together and get each other’s reactions. You need a special sort of person to do that, someone who can help you find your own path rather than impose theirs. It’s very good to hear from you, Bryan, and to know that Peter is in your thoughts. You were a much valued friend and colleague.